There were two things I thought I'd talk about in this blog. One, the state of online poker and two, dealing with downswings. As you can see, I started off very well in January/February, then had a very long breakeven stretch between March through to August. Since August I've been back on a heater. Clearly you can see that the games are still very beatable and that there is plenty of money to be made. There's always the problem of computer speeds increasing and bots becoming more prevalent. This is something I foresee to be a problem down the line, maybe 3-5 years from now I don't expect there to be many high stakes NL games (5/10+) still on the internet, however, I don't see a problem in the far future for low stakes NLHE. Basically, I think 200nl will be likely be around forever and possibly some mid stakes games. If you are playing just to earn some extra money or just to support yourself in between jobs, this is nothing to worry about. If you expect to become a high stakes crusher and earn millions of dollars, those days are passed. I play poker because there's not really much else I can find that I would earn a higher hourly rate doing and I expect this to continue for some time. You should always be thinking about a backup plan though in case something goes wrong. I've been spending time learning daily fantasy sports lately and also have begun learning more about investing the money I already have. Regarding downwings. You can see in the graph I've had a number of large downswings this year and I've also had some losing months. This is going to happen. To find someone who is always winning every month and does not have occasional downturns is going to be very hard as it is quite rare. If you can learn to deal with your downswings well, this is a place you can find a big edge on your opponents. Most people in the high stakes games are playing very well, even the fish for the most part play fairly well, especially if they are getting good cards. Anybody can play well when they are getting good cards. It's the times that people are getting bad cards, getting cold decked, not getting action on their strong hands, etc; these are the times that most people are making big mistakes and costing themselves money. Essentially it's a big game of tilt control. Everybody is going to run bad at some point, the big key to it is dealing with your emotions and your state control and not allowing it to effect you as much as it effects your opponents. I feel this is a big part of where my edge comes from today. Focusing on tilting less and just making the right decision every time the action is on you is going to be the number one thing you can do to ensure you have a successful poker career. Increasing your skill is obviously important and shouldn't be overlooked, this is something you should always be working towards, but tilt control is just as if not even more important. Play shorter sessions. When you feel things aren't going your way, take a break. Big thing here is get away from your computer. Even if it's only 5 minutes it gives you a chance to reset and relax from all the difficult decisions you are forced to make. Focus on your breathing when you're getting aggravated or upset. Remind yourself everybody takes these beats and that how you handle it now is going to define you as a player. Eat healthy foods and exercise before sessions. This wasn't so important for me when I was 21-25, but as I've gotten older it's become more and more important to ensure my brain is working well. Eat a quick meal in between sessions--all the decisions you are forced to make are very taxing and a little bit of protein can go a long way to recharge your brain for the next session. Strive for balance in your life. If poker is all you think about or focus on, you're going to tilt harder when you lose and it's going to affect your ability to play your A game while at the table. Constantly question if you are playing well. Think about the decisions you're making, if you think you're tilting it's just about always a better idea to turn the computer off and go do something else. The games are going to be there tomorrow and trying to win back losses when you might be tilted could cause you to make some big mistakes and dig yourself a deeper hole. Take your time, I know probably 95% of you guys act too quickly. Force yourself to think about the situation before you just click a button. This is the easiest way to avoid playing on auto-pilot. Anyways, please leave me feedback or comments on things you'd like to see on the site, and remember to sign up for the e-mail list. This blog post will be about three things. (1) A Special offer (2) Upcoming new video (3) Links to play online poker. So I've been working a lot on building this website and I have some new things I'm excited to share with you guys. (1) I felt the next step in progression of the website is to attempt to integrate an active community. In order to foster this, I felt a forum would be the best method. To get things moving I'm providing a special offer to anyone who participates. That means you guys need to get involved! This is your chance to introduce yourself to the community and to begin entering into a dialogue with not only myself but your online poker peers about your background, the passion you have for poker, and the goals you would like to accomplish. My offer is open to anyone who introduces themselves in the forums, I will e-mail you an unreleased video of an actual individual private coaching session that was paid for by a previous client. This particular video I would deem extremely valuable due to the extra care and effort I took to show him not only the specific ways that I use Pokersnowie to solve the problems that he encountered during this video, but I also use a number of other solving programs that I have yet to introduce you to. It's the type of video a poker training site would pay me $1,000+ to release. You will get a sneak peek at the way that I coach individual players. You will get to see exactly what goes on behind the scenes as far as when someone pays to have their game scrutinized and the type of advice they receive. The video content was provided by a client of mine in December of 2015 of him recording his screen while he played a session of NLHE. I then laid the audio over the video as I would in any video review, and I've blurred out the clients name for purposes of anonymity. (2) I'm excited to say that I've partnered with my first poker room affiliate. A site that I myself have played on for many years dating back to 2009. 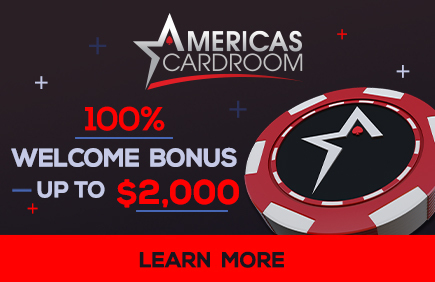 America's Card Room (ACR) caters to all players inside the United States as well as many other countries around the world. Finally I can show you guys where I play, how I go about setting up my account, adjusting my settings, and getting into real games for real money. I will have a video out for you shortly on the "Poker Videos" page of myself playing the lowest stakes, .01/.02 and showing you exactly how I would approach them. If you'd like to sign up for ACR I will include a link at the bottom of this page. Look out for the video being released soon though. (3) Clicking on the banner below will take you to ACR's website where you can download the software and immediately begin playing play money against other players. Or you can deposit up to $1,000 and get a bonus of the same amount you deposit. Essentially that means, deposit $50 and get $100 into your account. I wanted to make a quick blog post about the progression of the site and what to expect in the future. The preflop section is essentially finished, there are some small changes that will be made over the course of time as people ask questions and become more involved, but I think I've laid out a good framework for understanding preflop play. If you guys just follow the instructions I've laid out and study the charts, you will be playing well. The postflop section is going to be a bit more intensive as it is more complex to play well postflop compared to preflop, but I feel confident I'll be able to give you guys some solid advice for what to do and how to go about learning to play correctly. I'll be adding incrementally to the postflop section in the coming days and weeks. My vision is to have this site be a hub for everything that you would need to win at online poker. I use a number of different software and I play on specific platforms, I will eventually have links to all of these things as well as explanations as to how I use them and how they make me additional money. I also plan on organizing the learning process much more in depth once I have the postflop section completed so that it's easy to navigate and if you want to skip from one post to another more easily, you'll be able to jump directly there. Other things I've heard from you guys are that you wanted some information regarding where you should play and how to begin. I just recorded a video of myself grinding some micro stakes games. In that video, I give you a quick breakdown of the software I use as well as show you what stakes you should be playing, how to get into a game, and I give you guys an additional 20 or so minutes of instruction. In the postflop section I'm going to begin making you guys familiar with some software that I use other PokerSnowie. Each software has a specific purpose, and if you aren't aware of the changing landscape of online poker, you will be missing out on profit that you otherwise would have made. If you guys have any suggestions or comments about what any content you'd like to see me produce, I really want to encourage you to post and begin a dialogue with me. I will be sure to respond to every post. The task I attempted here was to essentially write a short journal after every session I played. The purpose was to attempt to determine if I have any sort of tilt. The idea is, I want to try to identify any times that I make a play or a decision for the wrong reasons. It also will, as a whole, serve to keep myself in check and not allow myself to get sloppy during my sessions. I'd encourage you to do the same, you can use mine here as an example. I think it would be reasonable to assert that from reading these posts that I may be slightly too results oriented. I think being results oriented is not a negative thing in and of itself and that there are benefits to being results oriented, particularly in certain scenarios. As a whole, I would argue that being results oriented all the time, or the majority of the time, is something we all want to attempt to avoid. Some of the things that you should be able to pull out of these posts I wrote during this period would be the attention I keep on my mindset in between sessions. How I consider the decisions I make when choosing to move from my first session to my second, my second session to the third and so on. You can see that I'm constantly considering how well I'm playing and how well I'm running, as well as how each of those things are affecting my mind state. The general idea being, we want to be trying to play our A game or as close to our A game as possible all the time. I think the difference in strategical play between someone like myself and a solid 200nl regular are not that great. Yes I do have better strategies, but the biggest difference by far is that I tilt much much less. For me, to tilt off a whole stack is something I would be very agitated about if I did more than once every 25k hands. Every decision I make has that constant concern in the back of my mind to avoid tilting off a stack. It's that important. Woke up at 8am today. Very strange time to be waking up. I know the games will tend to be good from 9am until about noon or one though so I want to make sure I am ready to be grinding at that point. I have a morning routine, or ritual, that I always follow before I begin playing, I suppose at a later date I can elicit exactly what it entails if you guys are interested. This was one of those very annoying sessions where all of my value bets get folds and all of my bluffs get called. Everything started off fine, I even made a successful light double float against a guy who called my BTN open from BB then lead into me for pot twice on 992r-5. I don't often peel the turn with no equity but I didn't think I should believe someone taking this line, my 1/3rd PSB on an A river won me the pot. I really need to focus more on thinking harder about each situation and looking for EV in every spot I can. I eventually got up to about 7 tables during this session and that was just too many to be able to catch spots like this. Overall it's tough for me to say if I'm happy with my play. I think I missed a good bluff spot in a 3bet pot w/ KQ on Q55hh-Ko-Ao after I cbet flop and turn from SB vs EP. I am not sure about my 3 barrel in another 3bet pot w/ AxQh on Kx3h4h-6h-2o, betting 1/3rd on flop and turn then 2/3rds on the river after 3betting from BTN vs CO. I should do some additional work on these two spots. My main feeling that I think I need to come out of this session with is that I was quite frustrated, down ~2.5k until I 3bet 88 SB vs BTN, he called, flop J87dd, I bet, and he made a pretty big mistake just jamming QQ all in and it got me back to even. Actually I wonder if it is a mistake, maybe it's not, I am a bit interested to run a simulation on that as well just to see. I'm certainly never calling with worse, and my range does hit this board quite well. Anyways, the point is, just one 4k pot like that can turn things very quickly and make me even. I actually felt like I should quit about 15 minutes before that hand happened, but I forced myself to continue to play, and it worked out. Heated up some left over chicken from last night in between sessions because online poker takes too much out of me mentally and I constantly need snacks in between sessions to keep my mind sharp. I feel at a severe disadvantage if I haven't had some kind of fuel. This was actually one of the smoother sessions I've had in quite a while. Very few tough spots popped up, most of my decisions were relatively easy. It feels like the overwhelming majority of my sessions I end up in ridiculously annoying spot after ridiculously annoying spot. I probably should have won more than a buy in, but I did get 1 outed on the river in a spot where I picked up top two pair. UTG opened 60, MP called, I called BB KQo. Flop K95r, chk, bet 120, call, call. Turn 4o, chk chk chk, river Q. Wasn't sure if it was best to bet or to check here. Felt that I couldn't rep many bluffs other than 67/78 since QJ made a pair and JT made the nut straight. If I bet I felt I might look too strong. An option would have been to bet smaller, like 150 into 500 or so but I just didn't see too many calling hands in either opponent's range. I also didn't see many bluffing hands either. I ended up checking, UTG checked, MP bet 295. I thought for a really long time. I think probably the play was to raise, but I felt like he appeared to be a bit of a weaker player which meant that he might not bet JT on the turn, or that he could do something ridiculous like check a really strong hand on the turn. I feel like I'm trying to convince myself that x/c was the best line but it seems like I'm failing miserably. I'm beat so so rarely here and I think I likely should have raised. Anyhow, I called and he turned QQ. If only every session was like this one. Began this session with a very terrible call down. It's actually a bit embarrassing how bad of a call I made. haha. I don't think my flop/turn calls were that bad, but the river I knew better. I opened Ac8d to 60 from SB, BB called. Flop Js9s9h, chk, bet 80, call. This bet of 80 is what threw me a bit since I think if he had QQ-AA he would 3bet pre, and if he had Jx he would not bet so large expecting I would x/c w/ A hi or a hand like 88. Turn came 5o, check, bet 380 into 280. This would have been a reasonable spot to find a fold, hahaha, but felt like now he only represented 9x and that often 9x would not choose to size this way for fear it would fold out too many of my hands. You should be able to see my reasoning is starting to get fairy poor though as I should have recognized the fact that when I x/c his large-ish flop bet my range now appears more like Jx than anything else and thus this overbet should actually look stronger than had he bet a normal size on the flop. This is just an example of a pretty stupid mistake, the type that I don't often make. I generally find the mistakes I make are ones of folding too often rather than calling too much. Anyways, I called another bet of about 2/3rd pot on a 4o river and was shown (what should have appeared to me!!) as a very obvious T9o. Anyways, the rest of the session I felt I played pretty well. Got a few lucky run-outs and was able to make some timely value bets and decent bluffs. I suppose I need to get it out of my head that every session I sit there and just all my bluffs get called and all my value bets get folds because it's not always true. I felt that possibly I should have extended this session and went on to play a bit longer as the games appeared quite good. I just have these pockets within my sessions where I tend to feel I'm losing my momentum and need a break. I used to feel them much more often around the 45 minute mark of my sessions, but I've since realized that I take too much breaks and don't play long enough sessions so this is something I have been working on. The 'poor momentum' feeling came around the 75 minute mark. The further out I can push these the better. It's something I really need to continue to work on. Eventually I'd like to be getting up to ~2 hours in per session. So now I have another decision as to whether or not I want to take a break and come back and grind some more or to call it a day. I've put in 4.5 hours which is a decent day (not as much as I'd like, but a good amount if I were to play 7 days a week). I'm now up $2,697 on the day. I have a big problem with not locking up my wins, thinking I should come back for one more session, then losing all my profits plus more quite often in that last session. If I do come back to play I need to record the session and keep the amount of tables down to no more than 3. I think I'll wait to use that strategy for another day since there's a big NBA game I want to watch on in an hour and I have been on a ~30k downswing over the last 3 weeks. The main goal I'm trying to accomplish here is to be playing my A or B game for as long a period of time as I can. If I come back for another session and I'm not in a great mental state, take a few beats, then begin having some tilt, it's going to lead to a crescendo of mistakes and will cost me a lot of money. A few mistakes here or there are going to happen every session, even if you're on your A game, and these can be easily overcome by having solid game selection. It's the tilt that really crushes most players, and in my experience from all the coaching I've done, while betting strategy is a key component that many lower stakes guys need to improve, it's their tilt that costs them by far the most money. I suppose over the next week or two I'll attempt to a bit less of such a conservative strategy and will document how that goes. What I'm most concerned about at this moment is to stop the bleeding from all the money I've lost recently and to book a solid winning day. So I'll be back tomorrow, hopefully I can build on this small amount of momentum as when those times happen that I have unshakable confidence are the ones that I profit the most. Woke up at 1pm today. A bit closer to normal than yesterday. Had to rush out the door for a dentist appointment at 2 so couldn't grind early. Finished with that around 3:30pm, and could have gotten in a session from 3:30 to 5:30 just before tennis at 6, but I tend to not get involved in sessions until all of my obligations are fulfilled for the day. I feel like this is a very key issue in keeping me even keel and my mind focused on my decisions at the tables. Any additional pressure, or anything that may get my mind off of poker at all to distract me tends to cause me issues. If I get down big in poker that first session, I might not end up going to tennis which is also really important. It didn't used to be so important for me when I was younger (I'm 31 now), when I was 21-24 I could just grind for 10-15 hours straight, but back then, the games were a lot easier and the stress was also not as intense. The reason I bring these things up is that I think it will be very valuable for some grinders to actually see how my days go, when I decide to play, what I do before I play, what I do in between my sessions, when and how I decide to stop. That'll be a main focus of this daily journal moving forward. So anyways, just got back from tennis, popped some leftover chicken in the microwave for some mental energy while I'm opening all my clients and getting ready to play, about to jump in shortly. Maybe this is just good karma for beginning to do this journal because for the last 3 weeks or so I've had no session like this. It kinda feels like it defeats the purpose of keeping a journal because everything just went my way. I flopped sets in 3bet pots, I turned quads versus higher sets, my flushes and straights came in on the river, my hands held up when all in versus draws. It somehow always amazes me how luck comes in huge bunches. For weeks nothing can be going my way at all, then all of a sudden, BAM, the stars align and the money just piles up. This is what you have to do in poker now, ride out the bad unlucky stretches, then cash in when the heater starts. Gonna take a short break, grab a snack, then come back for one more. Quite irritated at the moment. Pretty ridiculous of me to be so frustrated while being up over 4k on the day. This is something I need to work on and get over. If I made 4k every day I would be very rich. Started this session doing so well, was up ~3500 in the first 15 minutes. Slowly after that everything just began falling apart. One problem was that my number of tables crept upward of 10. This is far too many for me as when I get some negative momentum (losing a few pots all in a row), I begin tilting so much faster. I need to keep this number below 6 at all times, around 4 at most times is preferable. The part of this session that completely ruined me is when a 90vpip fish sat down at my table and immediately started destroying me. He ended up taking about 2k from me and basically distributed it back to the rest of the table. This happens to me quite frequently. I've had problems with guys like this for as long as I can remember. I know I sound like a very weak player telling everybody I can't beat guys who play every hand, but this is an issue for me. Put me against strong players who play a strategy that involves thinking, and I'm going to come out on top plenty by out-thinking them. A guy playing every hand, I lose 2 big pots against him and I lose my mind. What are possible solutions to this problem? Play much much tighter when these guys sit down at the table--my natural inclination is to loosen up to play more pots since if I can make a hand I think I can bust him, but this just gets me into trouble since he applies lots of pressure and I make only marginal strength hands thus ending up having to fold. I should not c-bet bluff these guys unless I have 8+ outs. I should lower my table number to 2-3 when I find a guy like this so I can concentrate all my focus on him. I should stand up and relax, remember to take deep breaths. I know that this guy is going to lose a lot of money in the long run, and he will do it quickly, so I need to be more patient against him. Not put any money in the pot until I have a reasonable hand. I need to accept that I'm not always going to beat a guy like this. I suppose I'll go drink away my sorrows while I study 20-30 losing hands from my last 3 days of grinding. I'll probably spend about 3 hours on that then go to bed. Woke up feeling sick on Thursday so made the decision not to play. Playing when sick can definitely cause you to tilt much more easily than you might otherwise. Your body is already in a state of fatigue and you have to try harder to fight back negative emotions when they creep up. Your mind also just works slower in general so you'll have a tougher time maintaining your A or B game. Throughout my career I've essentially just never played when I was sick, I don't think there's much point to it. If you're sick, your body needs time to recover, putting extra stress on it is only going to cause you to be sick for longer. Probably this will be my only session on the day since we've been preparing for a party which should end up starting around 9pm, and there's an NBA game I really want to watch starting at 5:30. This session I didn't feel particularly engaged or in the moment. It's very difficult to get in the zone when you only play one session in a day. Generally the days I get in the zone It'll take until the 3rd or 4th session I'll end up psyching myself up in the middle of a break and getting myself to that point. I'll make a note for a future post discussing the types of things I think about during breaks and how I get myself on the right track mentally. When you aren't feeling engaged, it's difficult to try as hard as you need to on each decision. You end up caring less about the results, and you get sloppy. This is why it's so important for me to gear up to playing by following my daily routine with the idea in mind that I'm getting myself in the mind state to grind. Today, I woke up, watched a movie, laid on the couch for a couple hours, didn't think about playing... Eventually I took a shower and began getting myself ready, but not with the idea that I was going to grind in my head, I think that's a key contributor here. I need to focus more on being prepared to grind and being prepared to put in longer days. It's been kinda crazy preparing up for this party, so I am thinking I'll probably take Sunday off (I usually take most weekends off) and then look to put in 40 hours next week beginning Monday. I woke up around noon today and got a few hours of studying in. Ended up going over a bunch of hands I played over the last week or two then got into the session. The 2 hour length is just too long, I need a break in between then, going to not make this next one longer than 90 minutes.This one started out pretty well, slowly grinding a profit, making good decisions. Just until I made two mistakes in a row. Both on the only 2k table I was playing. I've had a lot of trouble at 2k this year, running far under eV and just generally not winning. It's been a main stake of mine since 2010, so it's quite frustrating that I continue to struggle every time I sit down at a 2k table. There's a number of things that concern me, one is that I may be getting cheated. Anonymous tables seem like really good spots to find a friend who you share hole cards with and use that extra information to extensively widen your bluffing range. Another concern is that I'm playing scared money there due to not having had much success in that game over the last year. I can definitely afford to play these games, but I may be playing some hands in slightly different ways than I otherwise would if I were playing 1k. I struggle to know that I'm doing this even when I'm reviewing my hands, it's a very tough thing to know. I feel like the more frequently I play, the more of a chance I give myself to hit a heater and eventually get myself back on track there. I'm consistently showing big wins every 3 months, and over the course of the year, so this problem I think will be solved as time goes by. The biggest concern I have is that I'm not sizing my bets correctly. That even players I deem as worse than myself, or just poor on average, are making big folds when I'm value betting and being correct, then making super wide calls when I'm bluffing and also being correct. I've felt this has been going on all year, more so at some points than others. The reason I haven't investigated it further is that every couple months I have a big upswing and it seems to make up for a lot of the times I am feeling that I'm struggling or possibly making the incorrect choices WRT bet sizing. I do feel it's something I need to work on, maybe it is the problem that's keeping me from grinding 2k more frequently since the players are obviously better there and my mistakes will be amplified. I think I'll just stick to 1k for the rest of the day, try to drag myself out of the hole I've dug myself in this first session. A better result than the first session, I got lucky in one spot where I flopped a set w/ 33 on AT3ss in BB vs CO, I x/c flop, turn 4h, I x/c again, river Jo, I x/jam and my opponent had picked up two pair with AJ on the river. A lot of times this will happen in your sessions where either the right or the wrong river card in just one spot is going to effect your results heavily the entire day. For example, in the hand I lost earlier, I opened JJ UTG to 50, BTN call, SB call, BB call, flop KJ6r, chk to me, I bet 60 into 200, BTN fold, SB raise to 140 total, BB fold, I call. Turn 7s, BB bet ~2/5ths pot, I call, river 9, SB bet again about 2/5ths pot. I ended up jamming thinking that not often would a player raise small 4 way w/ QT on the flop, and if he did, he would likely bet much bigger on this river expecting me to call down w/ two pair or a set. Guess I got a bit owned there on the river and ended up losing a 4k pot because of it. To make matters worse, he showed me QTo, which meant my shove was much worse since he has 16 combos of QT in his range and only 3 of 66, so I just am losing tons of money very often there. That's maybe a strategy I should adopt when I'm in his spot, since most players I think will make the assumption I made that draws aren't raising 4 way and thus we won't 3bet the flop with any part of our range meaning the player in SB gets to set the price to see turns/rivers. It's a pretty smart strategy actually. I started to feel my momentum waning around the hour mark this time so felt like I needed to take a break, but then a 90vpip guy sat down on my direct right so decided to stay til he busted. I generally kept it very tight this time so as to avoid the situation from a few days ago. He lost his money very quickly to everybody else at the table and left. Gotta call that a win. Time for break two, then this 3rd one will probably be my last session of the day. It's really hard to win at poker when the times you make sets, other people make bigger sets. It's also hard to win when you make TPTK in a bloated pot and somebody makes a strange two pair. I think I played okay, but after some of these hands, started to feel like I was coming off the rails a bit, being a bit careless with some of my decisions, not trying hard enough. I find lately that I really need to challenge myself to try harder every session. The harder I try the better I play. The second I notice myself not trying so hard during a session or not caring about the results, that's when I need to quit. There's two kinds of not caring about results I guess, there's the kind where you just know you are making a range play and you sincerely don't care whether your opponent calls or folds, the other is when you are tilted and aggravated to the point that you don't care if you lose more money. The latter is what we need to avoid. So I'm up a little over 4k on the month now that I dropped this 3k today. I wouldn't say I have a stop loss, but it's very rare that I'll ever lose more than about 5k in a day if I'm playing 1k. That number is around 8k if I'm playing 2k. I usually just get too agitated and stop playing. This used to be a lot tougher for me back earlier in my career, I guess this is a result of me not playing poker for the same reasons I used to. Now it's just something that I have to do to not live on the streets, I know I'm not going to be the best player in the world, I don't see myself ever making millions a year from this, but I make a decent wage that I am satisfied with.